Check out our useful hints and tips articles to help you get the best out of your garden. Garden design and usage has seen huge changes over the years. Many years ago, a garden simply afforded a homeowner a hobby, a space for their children to play, and somewhere to catch the sun. Now, however, gardens are becoming more and more elaborate as people seek to create an extension of their homes: an area that they can both admire and actively use, whatever the weather. It's no longer simply about having a lawn surrounded by flower beds. A number of gardens will feature trees, topiary, carefully planned arrangements of plants or a water feature - and a growing number include a more solid, non-lawn area which is home to potted plants or an al fresco dining area. If considering a new non-lawn area, you will, most likely, be looking at one of three options. A gravelled area is the least labour-intensive in terms of construction, but gravel can easily infiltrate the rest of the garden. A paved area is also a common choice, but if your garden is not level, it can take a lot of groundwork to make the area suitable for a patio - if it is suitable at all. Gardens that aren't level, however, are perfect for decking, as the supporting piers can be sunk into ground of various heights to support the deck. Decking isn't for everyone, however, and the decision between gravel, paving and decking is often simply down to personal preference. 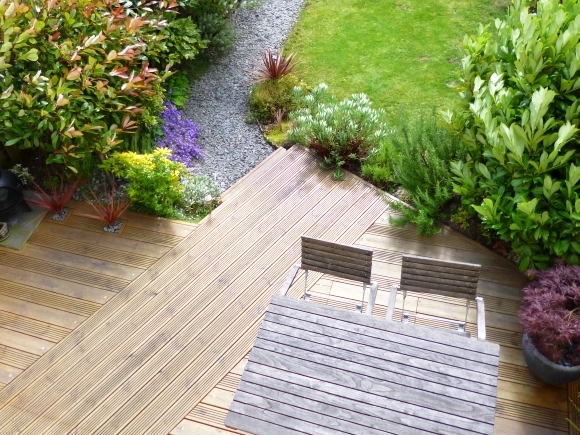 Those who opt for decking can choose from a range of materials - both natural and manmade. While natural wooden decking looks good, it can often require a fair amount of maintenance to keep it in good condition. Preservatives will need to be applied every year to two years to avoid splintering and to keep the wood from looking worn - however, if an exotic wood such as redwood or mahogany is chosen, your decking will require little to no maintenance. The downside, however, is that such woods are more expensive. An alternative option for those looking to avoid the labour of maintaining their decking is to choose a manmade composite option, which will generally consist of recycled plastics mixed with sawdust or wood. Composite decking is designed to look like real wood, with companies like Arnold Laver offering composite deck boards and accessories in a variety of finishes. The problem with composite decking, however, is that it is generally denser than the natural alternatives, and therefore retains heat - making it uncomfortably warm when barefoot in the summer. There is also a smaller range of colour options available (as natural wood can simply be stained), but on the plus side, no maintenance whatsoever is required. While there are both pros and cons of opting for decking over a patio or a gravelled area, there is no denying that creating an extension of your home can bring huge benefits, allowing you to enjoy your garden and treat it as a beautiful extra room.